From the moment you handle the CD case and carefully extract the liner notes, you know you are in for a very classy, modish experience with this trio comprised of Italian pianist Claudio Filippini, Swedish bass player Palle Danielsson and Finnish drummer Olavi Louhivouri. The glossy paper of the notes, the delightful stickers of album covers (far too beautiful to actually stick on anything), the mix of near-sepia and delicate colour photographs and, most satisfying of all, exquisite essays by Claudio and Daniela Floris. All these features whet our appetite even before we listen. We read how Claudio couldn’t believe he had been asked to play with two idols he had never met. How he was passing through a troubled period as a composer, how suddenly the very thought of working with Palle and Olavi strengthened and focussed him, like a compass pointing to the only true direction where you can align yourself – North – Facing North. Immediately we empathise with Claudio’s dilemma and anguish, and rejoice in its joyful resolution. And we are grateful for Daniela’s quiet shyness at being in their presence while recording, when she was dazzled by beauty, yet able to describe a wonderful experience to us. Then you listen, holding your breath, hoping your expectations will be fulfilled. And they are, immeasurably. The overwhelming impression this album leaves you with is joy. From the happy, smiling, cover photo to the final chord, this album is suffused with love, hope and a sense that strength, once received, never leaves you. There are six beautiful compositions by Claudio, a Henry Mancini, two Gershwins, the best Brian Wilson song ever (God Only Knows) and Adele’s song Chasing Pavements. The piano is a beautifully toned Steinway from the 1920s, the studio sound is warm and calm. Maybe it is not co-incidental that the opening track is Nothing to Lose with its subtle, cautious start, then growing confidence. The heart-breaking bass leaves you in no doubt that this is a very special session, this track was recorded in one take. The title track Facing North sings and swings, suffused with Bill Evans-like gentle harmonies, as if Palle brought something of the master with him from 1965 Stockholm and Claudio has picked it up, so subtly. Everything is subtle and ethereal on this album, as if you can’t quite believe it is happening. They recorded it in low lighting and that must have added to the atmosphere. Landscape opens with a shimmering terrain, gently rolling hills traced by the piano while the bass glides and soars serenely above it like a bird. This is a luxurious verdant landscape, nothing jarring here. The subtle use of the celesta adds a magical icy touch to several tracks like Sonatina and Soaking and Floating. What can you say about God only knows? The most perfect pop song ever written and here given a brittleness and fragility with ironic opening chords. Adele’s ambiguous Chasing Pavements is accorded great reverence, it is a lovely tune, rendered timeless here. Upbeat Modern Times closes the album sending us away feeling strong, optimistic, refreshed. Claudio has indeed proved that he had nothing to lose and everything to gain in this perfect album. Highly recommended. I must thank Ermanno Basso for making it happen. I imagine that every musician has a favourite instrument, and also a least favourite one, an instrument that they do battle with and try in vain to master. Fortunately for us, the double bass on Titanic for a Bike by Yuri Goloubev falls into the former camp. It is a Hungarian Janos Bogdany bass and has the sweetest sound in the hands of this Russian bass player who now lives in Italy. Yuri came to jazz from a very successful classical career in Russia. He calls jazz his “true call” and since 2001 he has played all over the world with many famous artists. Having seen Yuri with John Law last November at the QEH during the London Jazz Festival and more recently with Alex Hutton in a tiny venue in Stratford, I am struck by his modest, unassuming stance in performance despite his staggering pedigree as prize winner and Professor. He is mesmeric on stage, his gaze focussed, he frowns in concentration yet his fingers tell you that his technique is natural and effortless. You are swept away by his lyricism and the gorgeous sound whether his is barely skimming the strings or playing very fast indeed. He takes a delight in beautiful instruments. Talking about venues with pianos, I told him that the Parabola in Cheltenham has a Fazioli, and his eyes lit up with joy! This lovely album consists of ten tracks – eight by Yuri, one by long-standing collaborator, Asaf Sirkis, and one arrangement. Yuri and Asaf are joined by Julian Argüelles on sax and Claudio Filippini on piano. It is a wonderful combination, no-one dominates, there is a chamber feel. The sound is clear, like mountain air. 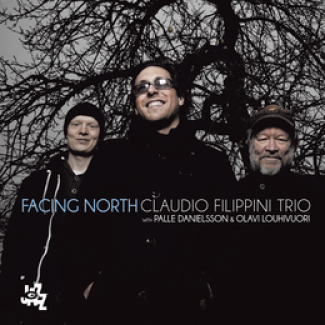 Claudio Filippini is a revelation (to me) on piano, a lyrical pianist who I will enjoy discovering on his recent album with Olavi Louhivuori and Palle Danielsson, Facing North. Julian’s delicate reedy soprano is showed to advantage in the intricate soaring melodies in four tracks. The opening track Sailing (by Asaf) sets a romantic tone with a serene opening between gently rocking piano and a bass melody that floats and soars. The title track refers to a real life situation of a cyclist wearing headphones singing along to the Titanic movie theme at the top of his voice, an odd image! It is a great track with a sawing bass creating tension – will this bike crash? Another track is called Bill Gates Amongst Us, a reference to a former Windows start-up sound played by Julian Argüelles. There is a quirky, eccentric feel to the titles and a personal touch to the liner notes. Other tracks are unashamedly romantic and Russian in feel – love stories, waltzes, remembrances of Schloss Elmau. This album has very quickly become a favourite of mine for its heavenly melodies, gentleness and tranquility. Yuri often plays with John Law or Alex Hutton, both of whom are touring this year. If you can, see Yuri live, he is intense and unforgettable. I’m pleased to add this to my blog as it reminds me of their gig at Wigmore Hall in Sept 2011 when Chris stunned the normally staid audience into whoops of delight! And Chris’s delight in performing without amplification was a joy too! Great Barrington, MA: Mahaiwe Performing Arts presents two groundbreaking young American musicians, singer/mandolin virtuoso Chris Thile and pianist Brad Mehldau, in a rare performance as a duo on Saturday, April 13 at 8:00pm. Both are virtuosos who boldly mix their respective areas of expertise-bluegrass and jazz-with influences from Radiohead to Bach. Now these kindred spirits combine their dazzling imaginations in an evening of classical transcriptions, pop covers, and original songs. Thile is a mandolinist and composer, Mehldau a lyrical jazz piano voice with the same wide range of musical interests. They join together for a rare evening that could go anywhere in the musical spectrum. Chris Thile, of Punch Brothers, has changed the mandolin forever, elevating it from its origins as a relatively simple folk and bluegrass instrument to the sophistication and brilliance of the finest jazz improvisation and classical performance.